This plant is very large tree found throughout the Philippines. It grows wild on Mt. Banahaw. 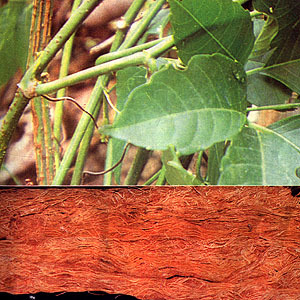 Gugo is used extensively in the Philippines for washing hair and for hair tonics. When the bark is soaked in water and rubbed, it produces a lather which cleanses the scalp very effectively. The active principle of the bark is saponin. A very large, woody climber. Stems thick as a man’s arm, angled, and much twisted and the bark is dark brown and rough. Leaves: tripinnate, the common petioles usually ending in a long tendril. Pinnae stalked, usually 4 in number. Leaflets oblong or obovate, 2.5 to 5 cm long, rigidly leathery and smooth. Flowers: 2 to 3 mm long, yellowish white, either crowded in long slender spikes from the axils of the upper leaves or arranged in terminal panicles. Fruits: pods, few, pendant, 30 to 100 cm long and 7 to 10 cm wide, somewhat curved, slightly constricted between the seeds. Seeds are hard, and circular with their sides flattened. For rheumatic lumbar and leg pains, sprains, contusions: use dried vine materials, 15 to 30 gms in decoction. For jaundice, edema due to malnutrition: use powdered seeds, 3 to 9 gms taken orally with water. Abdominal pains and colic: Pound the kernels of the seeds, mix with oil and apply as poultice onto affected area. Counterirritant: Make a paste of the seeds and apply to glandular swellings in the axilla, loins and joints, and swollen hands and feet. Hair wash: Soak the prepared bark in water until soft; express the juice by rubbing the spread fibers against each other until lather is produced; use as hair shampoo. This entry was posted in List of Medicinal Plants in the Philippines and tagged gugo, medicinal plants on March 12, 2009 by Pinoy Herbs.